1. 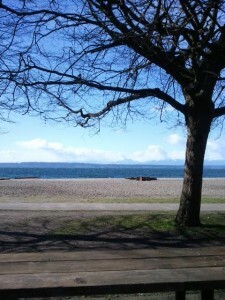 Golden Gardens. 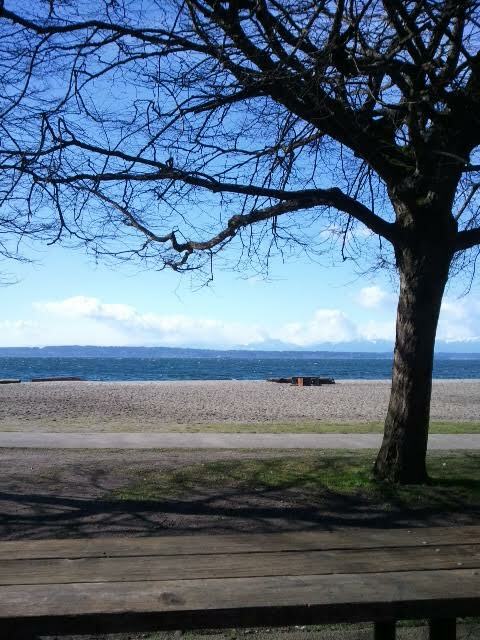 The name is a bit deceiving, but those of us from town know that Golden Gardens is not a garden but one of the best beaches in Seattle. 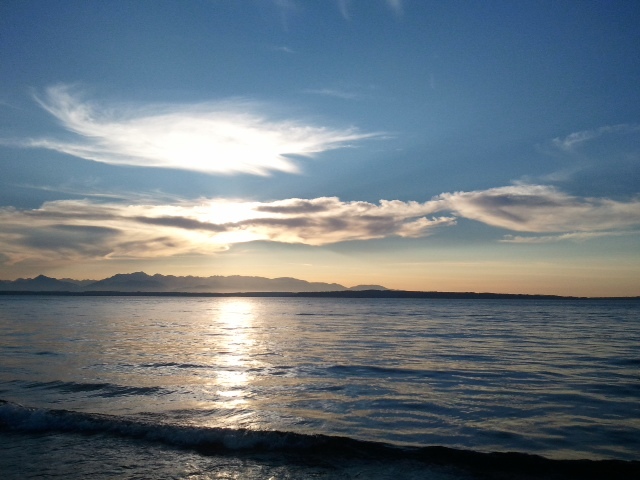 Situated on the Western edge of Ballard, Golden Gardens offers a sandy beach with amazing views of the Puget Sound and the Olympic Mountain Range. During the summer, the beach is a popular spot for locals and visitors to gather and soak up the sun. A snack bar provides refreshments during the day, and fire pits are a great place to gather when it cools off in the evening. 2. Hiram M. Chittenden Locks (Ballard Locks). Venturing back into town from Golden Gardens, you almost pass the Locks without knowing it. Situated on the waterfront, the Locks are a popular spot for locals and tourists to enjoy. You walk through a brilliant garden, the Carl S. English Junior Botanical Gardens, before you reach the Locks. 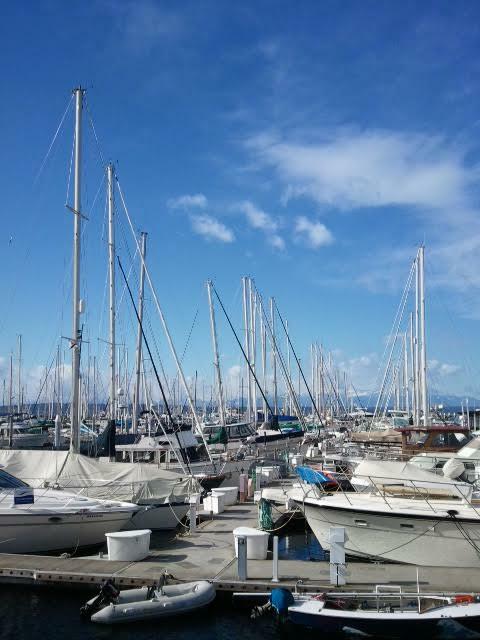 It’s worth the wait for a boat to come, as an assortment of everything from a kayak to a yacht get situated into a small space then raised to the lake or lowered to the sea. Cross the dam and discover the fish ladders. 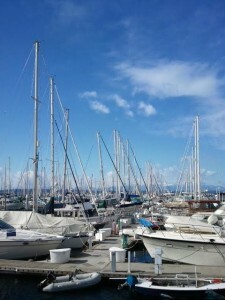 Take advantage of a sunny afternoon and set up a picnic at the park to watch the boats sail inland for the evening. 4. Carkeek Park. Located a little north of Ballard, but nonetheless as enchanting. 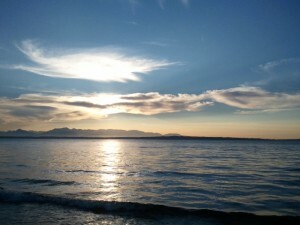 You would have to know Carkeek Park is there in order to find it. 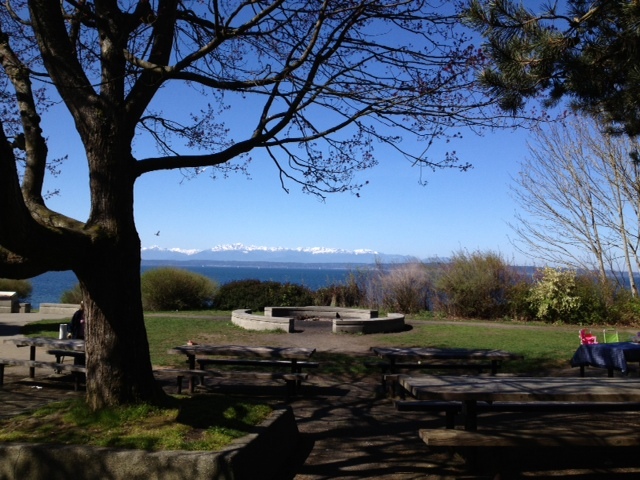 Wander through a forested area and end up in a hillside park overlooking the Puget Sound with breathtaking views of the Olympic Mountains. It’s an ideal setting for a family gathering. There are covered picnic areas with barbeques, and a playground area for kids. 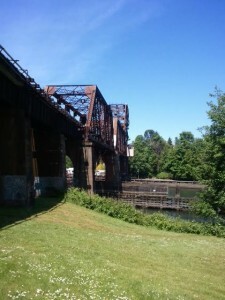 Take the walking bridge over the train tracks and down to the beachfront. 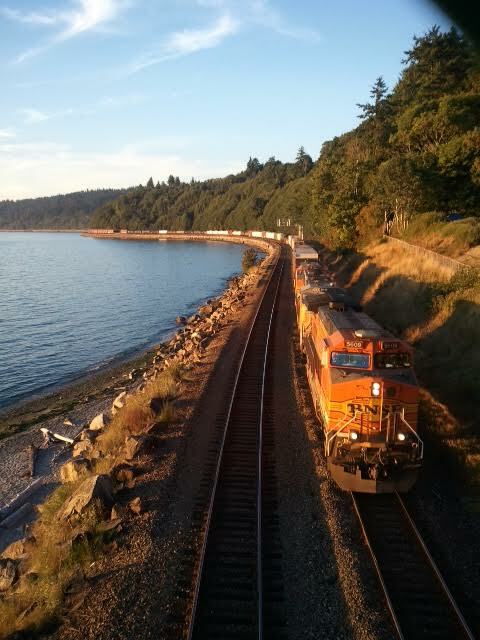 Be sure to time it so you can experience the rush as the train passes right below you, quite incredible! 5. Nightlife. Ballard is transitioning to a younger crowd. 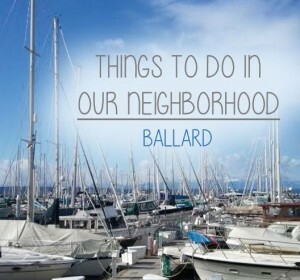 There are plenty of small bars and restaurants to accommodate a healthy nightlife in Ballard. 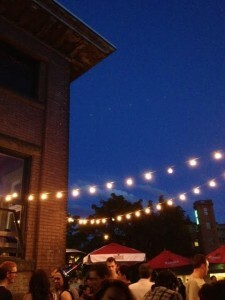 Down on Ballard Ave., the streets light up with activity, just make sure you’re prepared to be patient with parking. 6. 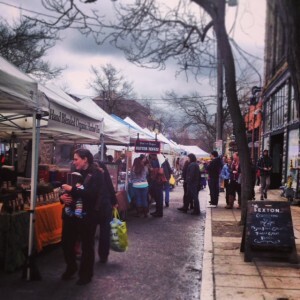 Cafés & Restaurants. 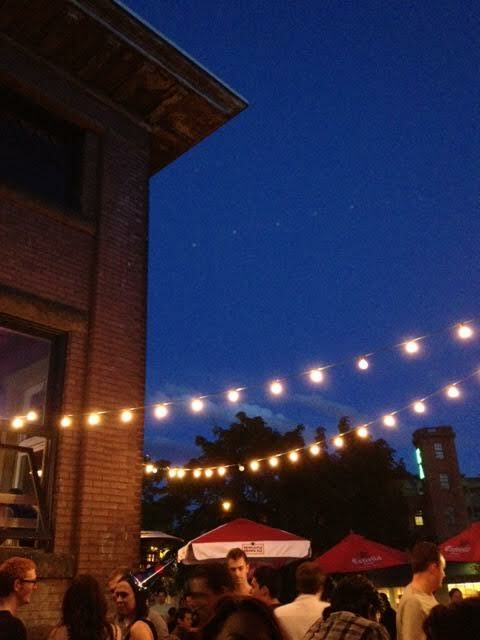 Some of the best dining experiences are found in Ballard. Head out to the beach and dine at one of the restaurants that overlook the Sound. Drive down Market and discover everything from sushi to Mexican to Italian. 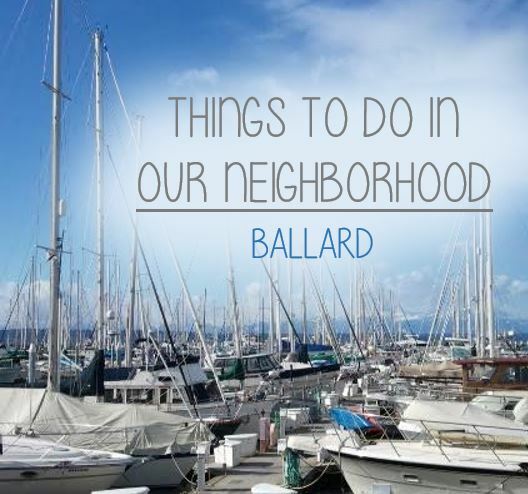 There are hidden gems off the beaten path too, go for a walk through the neighborhoods and you’ll probably stumble upon your new favorite spot. 1. SHEEN is the level of shine in a paint, for example egg-shell, semi-gloss or matte. Different paint manufacturers offer varying levels of sheen in their products, and may use unique terminology such as “low-luster” or “velvet”. Usually paint stores will have examples available so you can see it before you commit. Beyond aesthetic factors, higher sheens indicate higher durability in most cases, so it’s important to do some research to determine what level of sheen is appropriate for your project. 2. VOC is an acronym that stands for Volatile Organic Compound. Essentially, VOCs are harmful chemicals that are off-gassed from paint when it dries. VOCs are present in many building materials, and their presence is simply detected with an odor, such as that “new carpet smell.” With environmental laws growing more and more stringent, low and non-VOC paint products are becoming more prevalent. 3. LIGHT REFLECTANCE VALUE is displayed as a numerical value and describes the amount of light a particular color will reflect. A lighter color, for example, will have a higher light reflectance value than a darker color. This information is helpful when your room has limited natural light and you want to find a color that will maximize the light in the room give the illusion of more space. The light reflectance value can usually be found on the backside of a paint color chip. Keep in mind that sheen also has an effect on the light reflectance value, shinier sheens will reflect more light and therefore appear lighter. 4. ENAMEL is a type of coating that is classified by a higher level of sheen and greater durability. Imagine the surfaces in your home, what type of sheen do you see most often on doors and cabinets? These are appropriate places for enamel paint application. These surfaces are more susceptible to wear and tear and therefore need to be protected with an enamel type paint, as opposed to a normal wall paint. 5. LATEX is a binder used in water-based paint. It is commonly used by paint companies to describe a water-based paint in which the principal vehicle is latex. Nowadays, latex paint is more prevalent than oil-based or alkyd paint and coatings, partially due to environmental restrictions. 6. ALKYD is a synthetic resin used in oil-based paints. It is used to indicate a non-water-based paint. 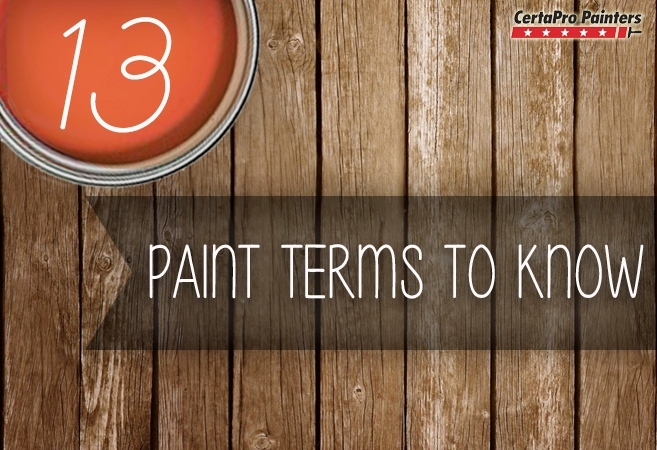 It is important to be aware of the chemistry of the paint in order to make sure coatings are compatible to layer. Alkyds will yellow over time. 7. MIL is a unit of measurement that expresses the thickness of the paint. Products will specify the appropriate mil build to ensure the best end result. If applied too thin, a product will not be durable and won’t protect the surface. If applied too thick, the product may not cure properly and there could be paint failures down the road. Painters use mil gauges to determine the mil thickness of their paint job. 8. SUBSTRATE is a fancy term used to describe the surface upon which paint is applied. Examples of substrates include drywall, wood siding, concrete, etc. It’s important to understand the substrate in the painting project to help determine the best paint system (primer, paint, top coat) for the project. 9. FLOW AND LEVELING are two terms typically used together to identify a paint product’s ability to level itself out upon application. A product with excellent flow and leveling will not show any brush marks and will have a very smooth appearance. 10. TANNINS are natural chemicals found in wood. Painted wood shows evidence of tannin stain with a brown discoloration on its surface. 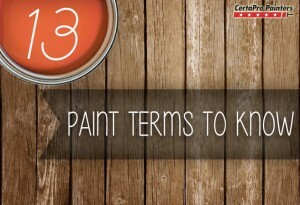 This is caused by tannins being drawn to the surface of the paint due to water below the surface or an application of latex paint (which is not necessarily resistant to tannin bleed). It’s important to keep in mind that tannin bleed may take time to be apparent, and its occurrence isn’t completely avoidable. If moisture is the issue, you must find the source of the moisture seeping into the substrate and eliminate the opportunity for more water to enter. Next, remove existing stains with an appropriate cleaner. Apply a primer that has the capacity to block tannin bleed, such as an oil-based primer. 11. MILDEWCIDE is a chemical agent that may be added to paint to resist or prevent the growth of mildew on the paint surface. 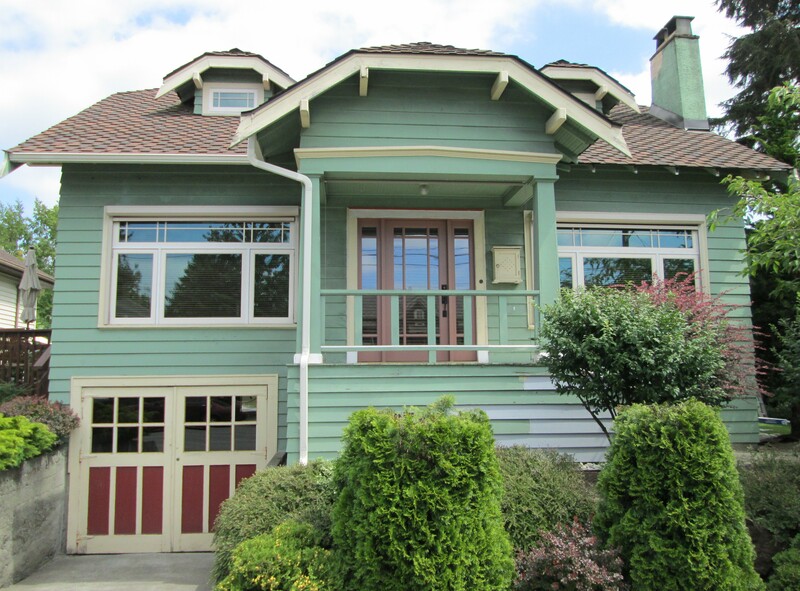 Most exterior paints inherently contain mildewcide, however it can be added when the paint is tinted. 12. SPOT-PRIMING is the act of priming selective areas, such as places where the paint is chipped off and bare wood is exposed. It might not be necessary to prime the entire surface, so in some cases spot-priming will be sufficient to seal only the areas that need attention. 13. COLORANT AND TINT Colorant is the paint additive that gives paint its color. Tint is the process of adding colorant. Paint stores will stock “bases,” which have a clear or milky appearance, and colorant is added to create the color on the swatch. The container is sealed and the paint is shaken to mix the colorant evenly. This process allows companies to provide a wider range of colors, and allows for customers to get custom colors matched. Feeling overwhelmed with the color decision process? These tips will help you have confidence that you’re choosing the perfect color scheme for your home. 1. 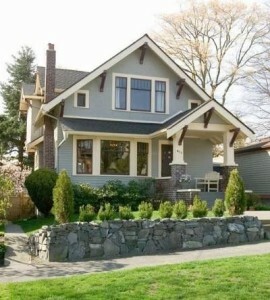 Research the style and era of your home. Selecting a color scheme that compliments the style of your home brings out that charm and character that you fell in love with at the beginning. Observe the colors used on the other houses in your neighborhood. 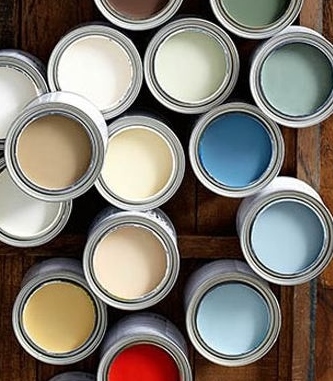 Ask the paint store if they offer paint palettes tailored to the specific style of your home. 2. Find inspiration. Ideas for your project can come from anywhere; your neighbor’s house, a magazine, or a color brochure at the paint store. Browse through pictures online and save your favorites. Whatever brings you inspiration, starting a collection of ideas will help you identify your personal preferences and narrow down your search for the perfect arrangement of colors. 3. Consider the colors of existing details. Chances are you aren’t starting from scratch in regards to your project, and there are elements that will influence your color choices. 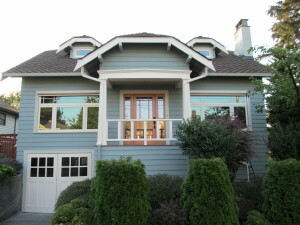 The roof is often a key component of the appearance of the front of the house, so it’s best to take it into account. The landscaping in your front yard, the stone or brick details, the pavement on the driveway are all aspects to consider. 4. Think outside the box. Take advantage of this opportunity to change up the appearance of your home. 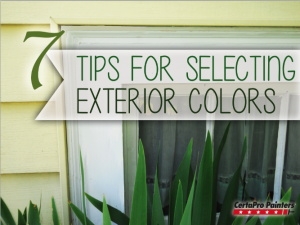 Beyond the body color and trim color, there are different ways to use color on the exterior of your home. Consider the fascia, gutters, soffits and downspouts. 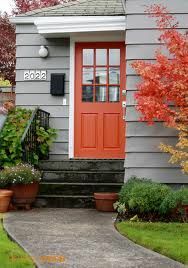 Perhaps all of these details match the body color, or use contrasting colors in certain areas to bring out the character of the home and boost curb appeal. Using a light color on all of the trim, fascia and gutters, for instance, frames the house for a clean look. 5. Don’t be afraid to use an accent color. Ideally, you want to limit yourself to no more than three colors in your exterior scheme; body color, trim color and accent color. Accent colors provide visual interest. 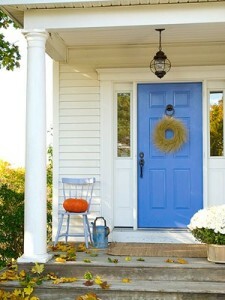 The easiest place to draw attention with an accent color is the front door. Bold use of color for the front door gives you the opportunity to show some personality and provide a welcoming feel for the front of your home. 6. Metamerism. This a phenomenon that occurs when colors appear to change in different lighting environments. 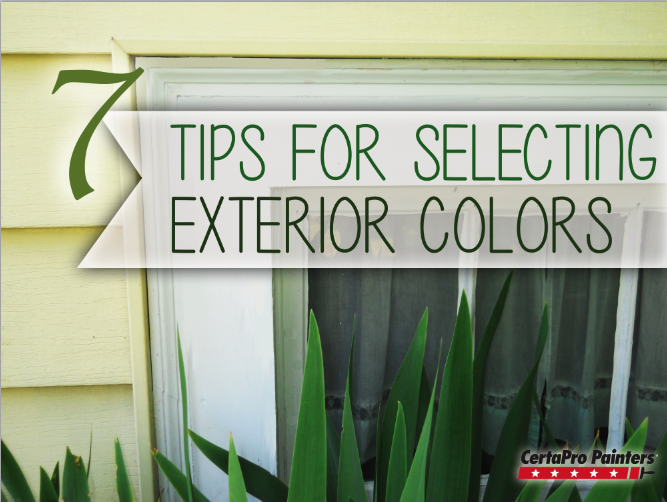 It is particularly important to keep in mind when you look at exterior color samples indoors. The same color can have a different appearance in natural light. When choosing colors for any area of your home, inside or out, it’s best to observe the colors under the same type of light that it will end up in. Under the same principle, color can appear altered at different times of the day. 7. Take advantage of tester samples. Considering the principle of metamerism, color can also look different in a larger scale or with different levels of sheen. Paint samples are a very important part of the color decision process, allowing you to view the color as true as possible to the finished result. Instead of applying the paint directly to your house, paint the sample on a large poster board and tack it up against the wall. Observe how the color looks on a large area, and it changes throughout the day. You’re going to come home to that house every day, you might as well make sure you are happy with the result! What is the best way to prepare my walls before I start painting? 1) If there is any obstacles in your way (pictures, furniture, etc.) it is best to remove these objects from the room to make your job easier. This also lessens your chances of knocking over any potential paint cans lying on the floor. 2) It is important to remove any debris or dust off the walls. We recommend using a dry towel or barely damp towel to remove any dirt or dust that accumulated. If your walls are a satin, matte, or eggshell finish we recommend using a dry towel. If your walls are semi-gloss or gloss, a damp towel will work better. 3) If you are painting a kitchen or a bathroom, we recommend using an anti-microbial solution diluted mildly with water. Anti-microbial solution is the best, however bleach diluted in water is an alternative if anti-microbial solution is not available. 4) Allow the walls to dry, before taping off any objects fixed to the walls (baseboard trim, wall scones) or before taping off the ceiling (crown molding, ceiling fans/light). Sometimes even the best taping jobs still let paint leak through. To combat this, you can put a small amount of silicone on your finger and apply it gently to the edge of the tape. It is best to use a thin rubber/latex glove to apply the silicone, as silicone is extremely sticky. Allow the silicone to dry completely before applying any paint to the walls or area that you were taping off. 6) After the primer is dry, you will have a clean landscape to work with and can start applying whatever color paint you would like. 7) Depending upon the color you use and how you apply coverage expect to apply between one and three coats of paint, with the typical application being one or two coats of paint. Let the paint dry completely between applications. It is best to let the paint dry naturally on its own. Painting can be an enormously satisfying job for the result that you will see when you are finished. However, preparation is very important to ensure that there are no messy and hard to remove mistakes. To prepare your room, remove everything, including curtains and blinds. If this is not possible push all furniture to the center of the room and cover it with old shower curtains or sheets. Cover the floors with tarpaulins or thick canvas. Use masking tape to tape down your floor covering. Roll the masking tape out across the floor and the wall where you will be painting. Use masking tape also to cover any skirting boards, door or window frames. Masking tape can make your job so much easier, as you will end up with a good clean line when you peel it off. Just be sure not to wait too long after finishing your painting to peel it off as it can cause dried paint to peel. Wash the walls using sugar soap. This will remove any grease or dirt. It will also help you identify any other imperfections which you may need to touch up. If previous paint is peeling, scrape the surface back and sand it until smooth. If there are any cracks, these should be filled using premixed filler and sealed using an acrylic sealer undercoat. Once this has been done, sand the walls until smooth and wipe away any dust with a dry cloth. When choosing your brushes, be sure to check out all the options available to you which may make your particular situation easier. There are many different styles of brushes and in particular some which are designed for sliding along difficult to paint corners. Brushes and rollers should be chosen for quality, it can be quite frustrating trying to pick away loose brush hairs from your freshly painted wall. Once you are certain that your surface is clean and smooth, you can begin painting. When applying the paint begin at the top of the furthermost corner from the door and work your way down and back. When using a brush, a diagonal crisscross pattern is the best, rather than straight up and down. Be methodical and pedantic to ensure that you get the most evenly spread surface. Be a perfectionist, fixing each problem as it comes up. Depending on the original colour of the wall that you are painting, you may need two or even three coats. You may wish to experiment with a different paint finish. These are applied after your base coat. One popular paint finish is sponging. To do this dip a dried sea sponge into paint and dab it on the entire surface of the wall. Another method is rag rolling, where you apply paint rolling a paint covered rag across the wall. Combing can be quite effective, but requires some concentration and coordination. For this method cut even notches into the edge of a squeegee blade. Paint a coloured glaze over your dried base color and draw the squeegee blade through the glaze. These types of finish are best achieved by two people working together, as you often need to work fast after the gloss has been added, before it has time to dry.